Single; large flower, overlapping petals of pastel creamy pink shades. Flower cup shaped, petal segments of good substance. Early flowering, stout, semi-dwarf bush, of spreading stature. 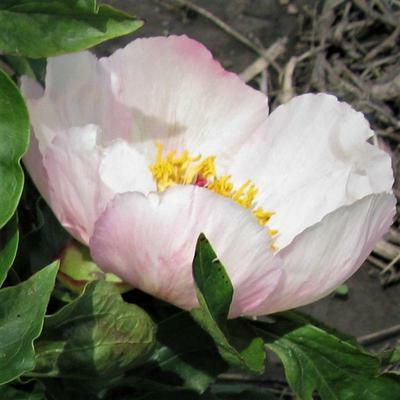 A special choice for an early flowering peony in the garden. Best Landscaper. Quadruple hybrid [Saunders Quad-Hybrid]. Parentage: descends from P. lactiflora, P. macrophylla and P. officinalis with P. mlokosewitschi. Presumed triploid, limited fertility, pollinate with a tetraploid.